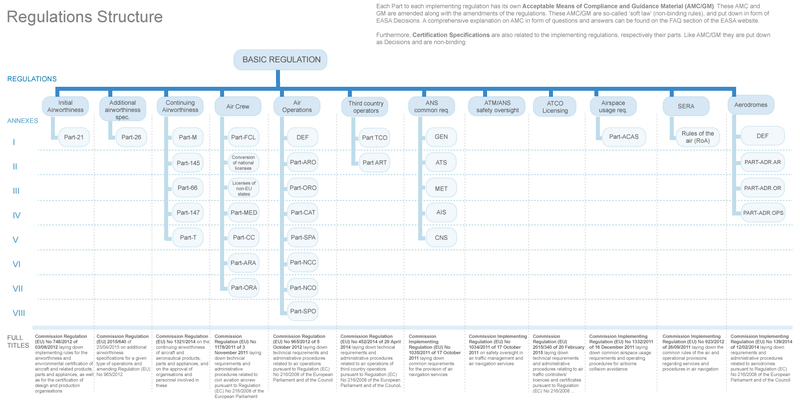 Navigate through the regulation structure by area of implementation. When available the corresponding AMC & GM are offered on this same view to facilitate your reading. ‘PART-21 proportionality’ Introduction of proportionality and simplification of airworthiness and environmental certification regulations for small aircraft. Commission Implementing Regulation (EU) No 628/2013 on working methods of the European Aviation Safety Agency for conducting standardisation inspections and for monitoring the application of the rules of Regulation (EC) No 216/2008 of the European Parliament and of the Council and repealing Commission Regulation (EC) No 736/2006.